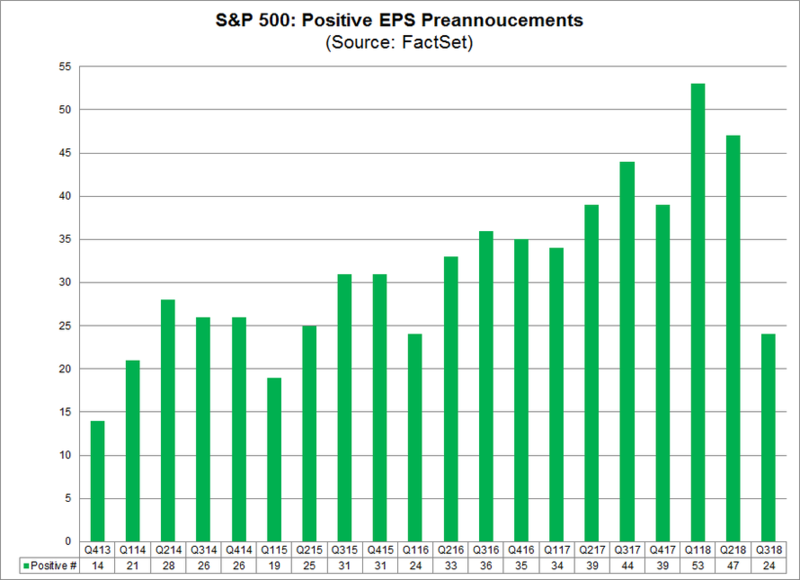 After a spectacular Q1, and a Q2 earnings season that blew away expectations, corporations are turning decidedly sour on their own prospects, and according to FactSet data, as companies head into the end of the third quarter 98 S&P 500 companies have issued EPS guidance for the quarter. Of these 98 companies, 74 have issued negative EPS guidance and 24 companies have issued positive EPS guidance. The percentage of companies issuing negative EPS guidance is 76% (74 out of 98), which is not only above the five-year average of 71%, but if 76% is the final percentage for the quarter, it will mark the highest percentage of S&P 500 companies issuing negative EPS guidance for a quarter since Q1 2016 (79%). What is behind this shift in sentiment? As pessimism is rising, optimism is fast fading: while the number of companies issuing negative EPS for Q3 (74) is just 3% below the five-year average (76), the number of companies issuing positive EPS guidance for Q3 (24) is 23% below the five-year average (31). 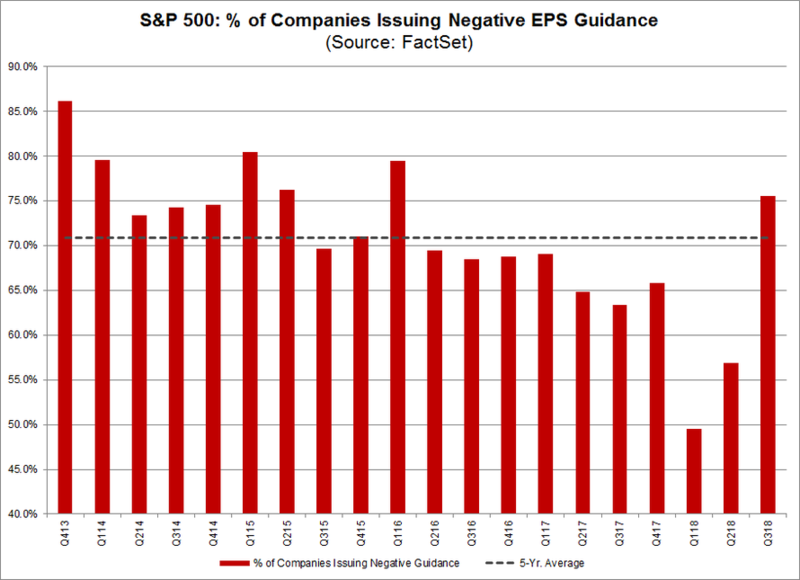 Thus, according to Factset, the low number of S&P 500 companies issuing positive EPS guidance is the main contributor to the above-average percentage of negative EPS guidance for the quarter. And similar to the above, if 24 is the final number for the quarter, it will mark the lowest number of S&P 500 companies issuing positive EPS guidance for a quarter since Q1 2016 (also 24). So which industries are at the forefront of this sharp reversal in sentiment? At the sector level, the Consumer Discretionary sector has seen the largest drop in the number of companies issuing positive EPS guidance for the third quarter (2) relative to the five-year average for the sector (5.6). 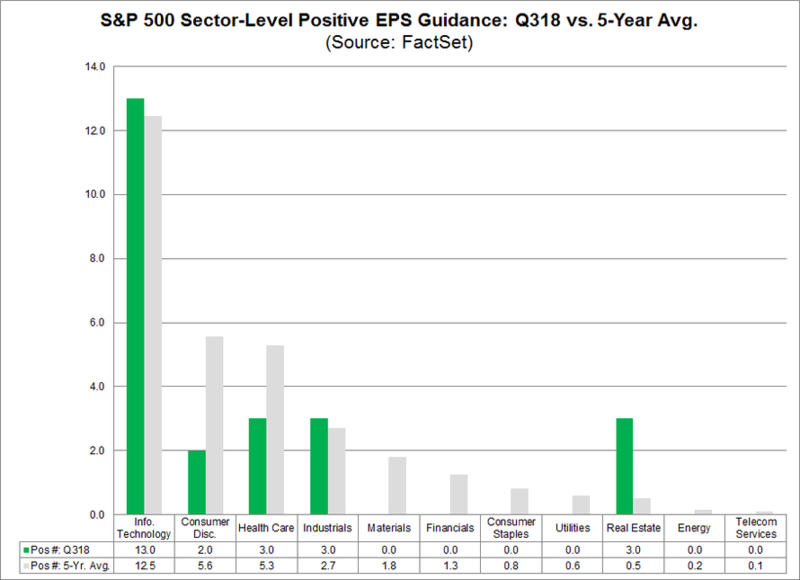 However, several other sectors have seen fewer companies issue positive EPS guidance for Q3 relative to their five-year averages, including healthcare, materials and financials. Only Info Tech and Real Estate have managed to keep their cheerful disposition.